Mobile search is evolving to such an extent that even search engines are often not the first port of call anymore. With the rise of voice search and personal assistants like Cortana and Siri, search engines are now competing with the more personalised information available on an individual’s smartphone as well. It has never been more important to optimise your website for mobile search and make sure that you rank well for all of your important phrases on a mobile device. 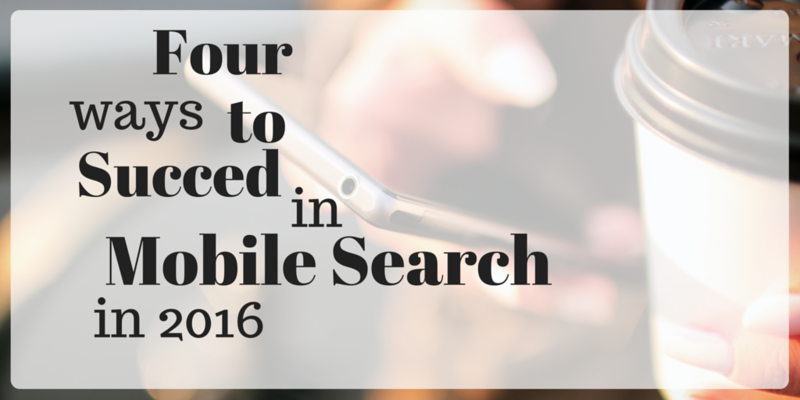 Search is set to be turned on its head in 2016; here is now you can navigate the changes. In May, Google announced that mobile search had “overtaken desktop search in ten countries” and that paid clicks had risen 23% year on year. This comes as a result of people doing more and more on their mobile devices. This shows how valuable it is to optimise all of your important content for mobile search; however, you can’t do this without knowing more about how search trends are changing. Voice search is also growing. In 2014, half of all teenagers with a smartphone used voice search to access information as well as 40% of adults. In 2016 is set to be even more of a thing. Not only because of the growth of mobile in general, but Microsoft is also installing Cortana on its desktop PCs. The difference between voice and typed search is that voice search is naturally more personalised and conversational. This makes logical sense when you imagine that most people would probably feel silly saying “cheap hairdresser Bournemouth” into Google Now or Siri. The result of more conversational search queries is that they are longer and incorporate more “how”, “why”, “where”, “what” and “who” questions. Search queries are typically longer as well, averaging at approximately three or four words per query. Keep an eye on both search volume in your industry and the search queries bringing search traffic to your website and make sure that you optimise your content to answer these queries. Note the difference in advice between “optimise your content to incorporate these new keywords” and “make sure you optimise your content to answer these queries”. This is the difference between good SEO and the sort of activity you’d find being done in 2009. For example, Call2Call, one of our long-term clients, has seen a massive upswing in mobile traffic over the last year and a half. We have had to adapt our approach to the content that is being published on their website to ensure that mobile is accounted for; making sure we are answering questions with a lot of mobile search volume that are focused on things like how to find access numbers for international calls and how to use these numbers. The long-term plan for this is to add a lot more FAQ/blog type content to make sure these questions are being answered. Bing is experiencing a bit of resurgence in terms of its relevancy to search. 20% of all searches made in the US are through Bing. Not only this, Bing powers Yahoo search and also Siri and Cortana and has done since 2013. The time where Google dominated search and every vertical across the world is well and truly over. Google still rules search in many verticals and in the UK, but Bing is a contender that should not be pushed to one side. So, if you want your website to rank well for a spoken query into Siri or Cortana, you’d better make sure you’re ranking well in Bing. It’s easy to add a search engine into your reports if you’re using AWR Cloud. Just go to the account settings for your account and add Bing. Make sure you also include the mobile version! Also, make sure you set up Bing Webmaster Tools, which is a great way to check out the search engine indexes the pages on your website. A report that just provides general rankings is not going to cut it anymore; you need to not only look at your keywords in desktop and mobile separately, it is also important to ensure that you are able to cross reference rankings with monthly search volume figures and the traffic that they bring to your website. You’ll still need to look at mobile and desktop together, but side by side for comparison purposes so that you can see where big discrepancies are. For example, if any of your pages is being flagged for ranking a lot better. And also make sure you have the search volume figures for each phrase ready to cross reference with. In AWR, you can export ranking reports as an Excel document, do this for all of the above and use a VLOOKUP formula to pull everything in to one sheet. If you have also pulled in your search volume figures, you should have an excellent bird’s eye view of where is best to focus in your SEO optimisation. This is optimisation that takes into account the fact that Google wants to answer questions intelligently rather than just crawl documents for exact match text matches. Use nouns when naming things like places, countries, celebrities and things in general. Create a Wikipedia page if you can. Utilise semantic markup wherever you can, give search engines a hand whenever there is an opportunity to do so. Get to grips with Freebase as this is a site used by Google when they pull information together for the Knowledge Graph – If you can use the entity canonical “sameas” to link to a matching Freebase entry for your content, even better! Direct Answers is Google’s way of pulling content directly from a relevant page and displaying it in the SERPs as the result of a search. While some SEOs are worried it will stop the user from clicking through to your website, it does position your website at the very top of the search engine results and provide lots of visibility. It’s also likely that you’ll still get a click through as well as your brand name being remembered in future for having provided the right answer. Welcome to the AWR Blog! Bit hard to get to grips with Freebase when it has gone read only.